I've been on the hunt for a pair of good wedge sneakers for quite some time now, and I finally did it. I bought one! Here they are my lovelies - Steve Madden ‘Hilight’ Wedge Sneakers. I’ve worn them several times already and no regrets, no complains at all! 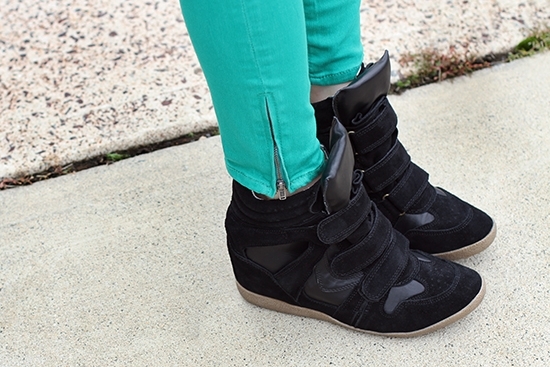 Extremely comfortable and stylish wedge sneakers. What do you think? Do you like them? I'm not particularly keen on wedge sneakers but I gotta say that the outfit together looks great! 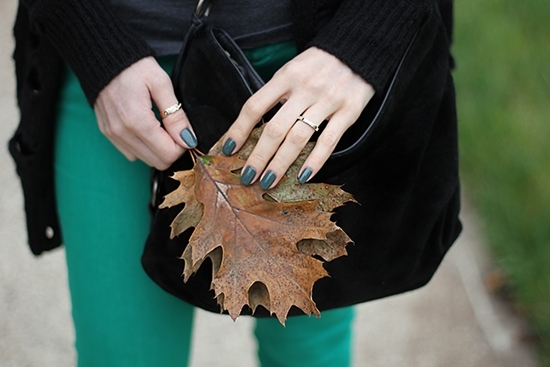 I love the green pants and the leopard print scarf :) Nice photos with that fallen leave! This cardigan is so cool! Great rock look! i love how you have given so many options where to get what you are wearing...love those sneakers...they look awesome. hey, would you mind to follow each other? let me know.leave a comment on my blog. I love your outfit. Just came across your blog and oh my gosh, you have the cuuutest style! Love it. very nice blog;) you have a great style;) maybe we can follow each other :) ???? these sneakers are so cool,loved them ! love this look so much! very inspirational! Your outfit is perfect!! I love it! Survived Frankenstorm. Blog Time Again.